WASHINGTON — Millennials face vastly different challenges financially than their parents and grandparents. With student loan debt surpassing $1 trillion in 2014, financial planning may take a back seat to paying for immediate expenses. Millennials are less likely to be homeowners and are more dependent on loans to pay for college, according to a “15 Economic Facts About Millennials” report from the Council of Economic Advisers. After the Great Recession, the amount of 18 to 34-year-olds living with their parents also sharply increased. These challenging economic conditions during the start of a young adult’s career can have a lasting impact on lifetime wages, especially for those with a college degree, according to that report and other research. For those reasons, finding the right financial adviser as a young adult could have lasting benefits. While people of all ages are subject to poor advice from financial advisers, millennials are at the beginning of their careers, and are especially impacted by good – or bad – advice, the report said. The Department of Labor recently updated its requirements for providing financial advice to individual retirement plan savers, saying those saving for retirement lose $6 billion to $17 billion a year because of bad investment guidance. Specifically, more kinds of financial advice and services are now subject to the Employee Retirement Income Security Act (ERISA). 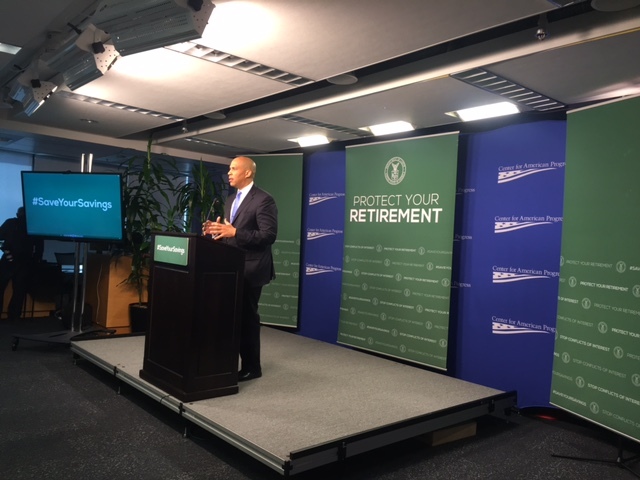 Last week, Sen. Cory Booker, D-N.J., attended an event hosted by the Department of Labor on retirees, their finances and the updated requirements. Booker backs the recent Department of Labor changes, and said in an interview that it will also benefit millennials. If young adults start saving in their early twenties, Booker said, they could retire with a significant fortune. But if they don’t start early or if they pick the wrong adviser, he added, they may not be so fortunate. “It could be the difference between retiring with comfort and security versus having no security and a lack of comfort,” Booker said. The challenge is knowing the details of a potential adviser, especially when some can charge high fees that could take a large percentage of your longtime savings. Jeremy Portnoff, founder and CEO of Portnoff Financial, LLC said there are not many avenues for quality advice for millennials. T. Christopher Bell, 26, has been a financial adviser for four years and believes millennials are missing the opportunity of investing early. “Our student loan debt epidemic is causing millennials to become victims of paralysis,” Bell said. With the amount of student loan debt that millennials have accumulated, some advisers are seeing many of them living with their parents or renting with friends. Student loans are taking up the majority of expenses for these young adults, according to Katie Burke of Wealth by Empowerment, who specializes in financial consulting for woman and millennials.